Whether it's The Crooked Man or The Nun, they're scarily iconic in their own rights. Yet we, as the audience, can't deny that both characters play with the classic horror element that gets us every time. The Nun is seen wearing, well, a typical Catholic nun outfit with black cloak and cross necklace. It's her scary face that makes it perfect costume for halloween. 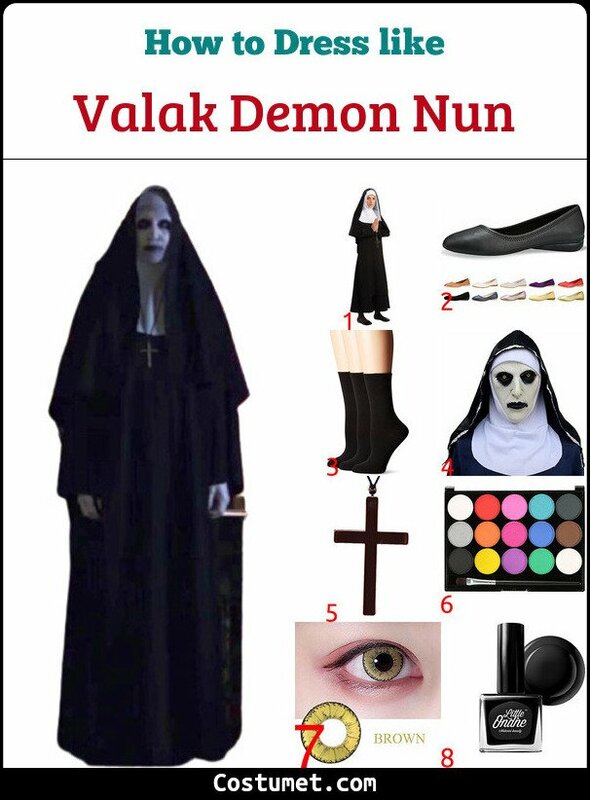 If you're ready to dress so spooky and ready to dig in, checkout our DIY tutorial and item down below on how to dress like the demon nun. 1 Black Nun Robe Get a typical nun costume to wear. 2 Black Flat Shoes Get a pair of black flats to match your outfit. 3 Black Socks Cover your exposed ankles with black socks. 4 The Nun's Mask Don't want to waste your time doing makeup? Get the Nun mask here! 5 Cross Prop Get a cross prop to wear around your neck. 6 Face Paint Look for face/body paints in black and white color and follow the makeup tutorial down below the list. 7 Yellow Contact Lens Make it believable by wearing a pair of yellowish contact lens. 8 Black Nail Polish Make your nails look disturbing and dead using a black nail polish.